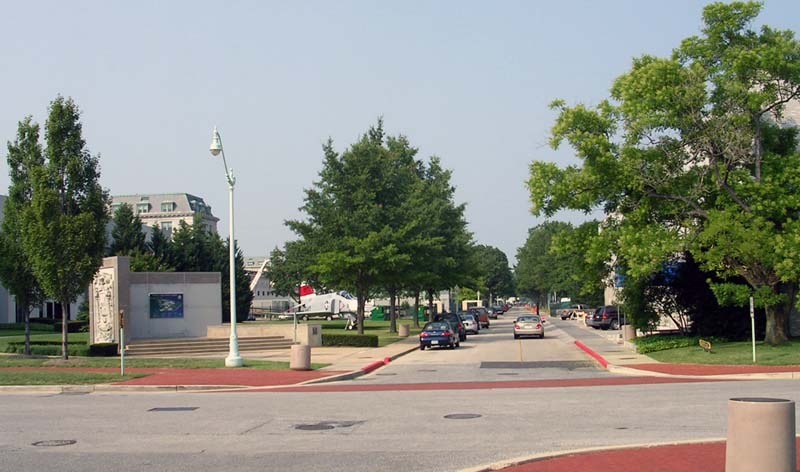 Annapolis is located 50 kilometers east of Washington. The U.S. 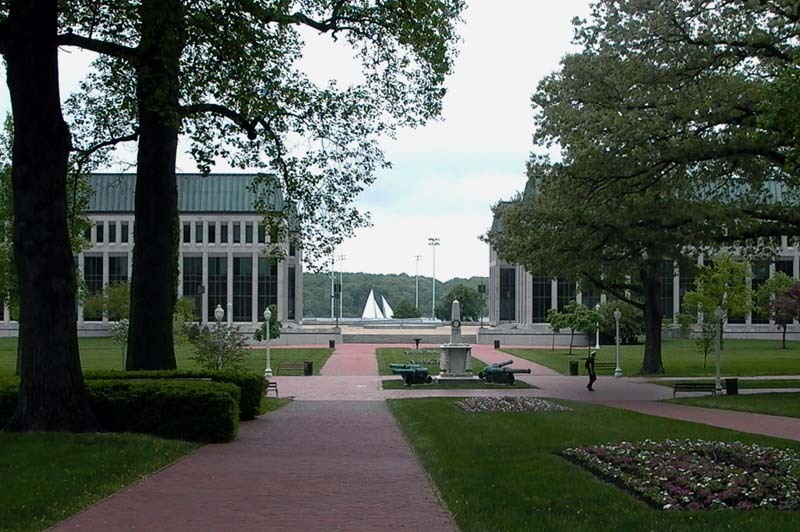 Naval Academy is there. 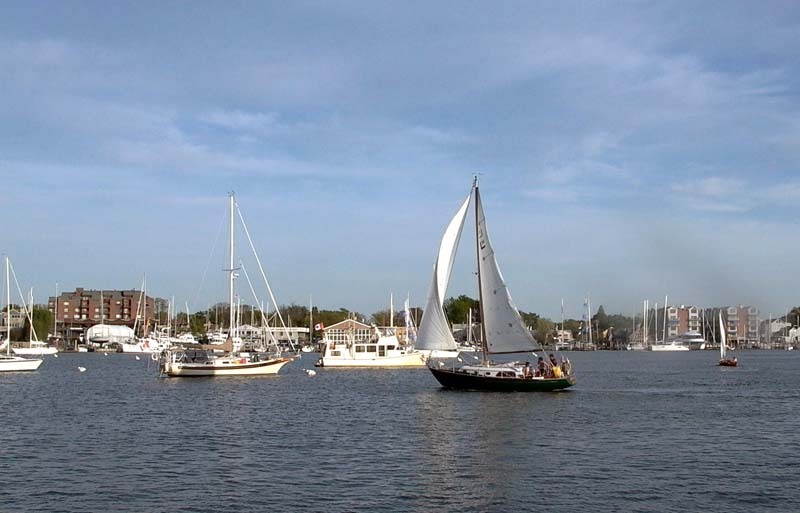 Annapolis is a very beautiful town, and I go there often for rest and recreation. Let us look at some photos. 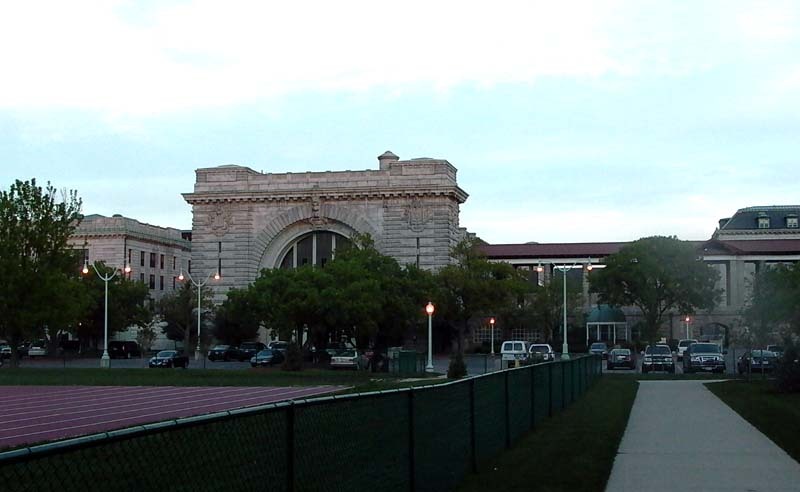 The Naval Academy was set up in 1845 as an elite technical college like MIT, and its most famous graduate was Albert Abraham Michelson, who was the first American physicist to get a Nobel Prize. 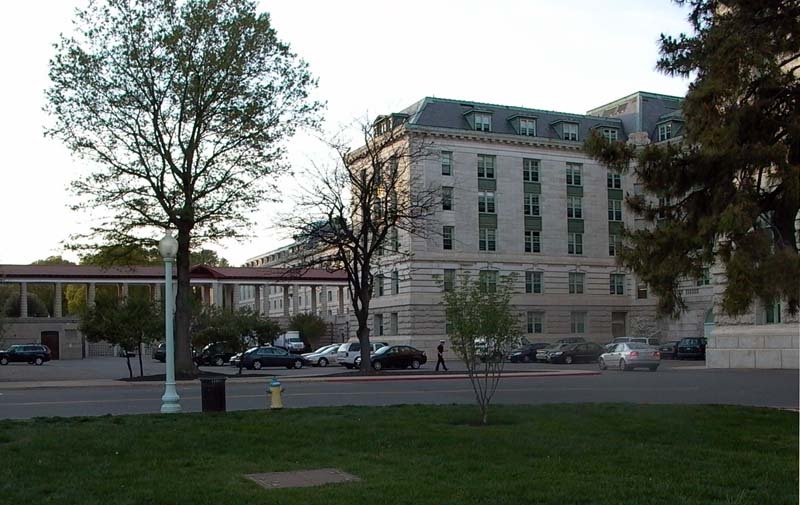 Jimmy Carter studied nuclear physics there, and he also received a Nobel prize. He was once the president of the United States (1977-1981). 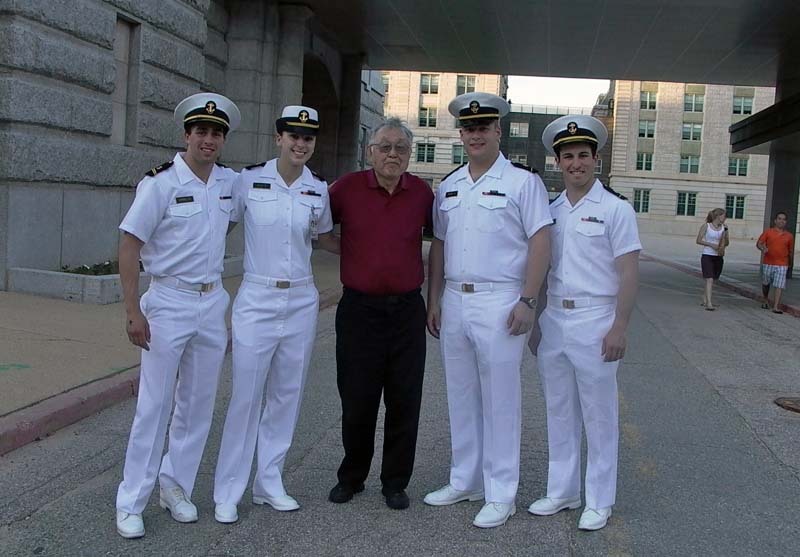 Joseph Weber was also an Annapolis graduate. 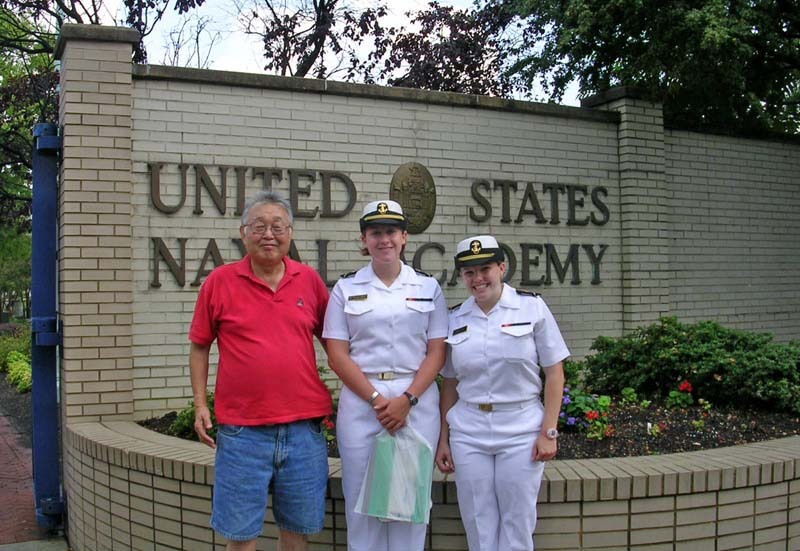 He was the skipper of a small navy ship during the Pearl Harbor bombing in 1941. His ship was not important enough to be a target of the Japanese attack. 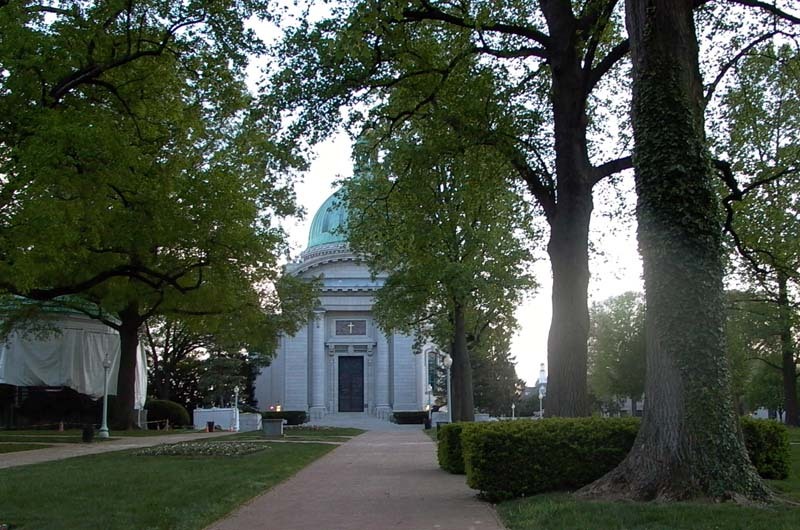 After the war, he joined the University of Maryland, and dedicated his life to the detection of gravitational waves predicted by Einstein. 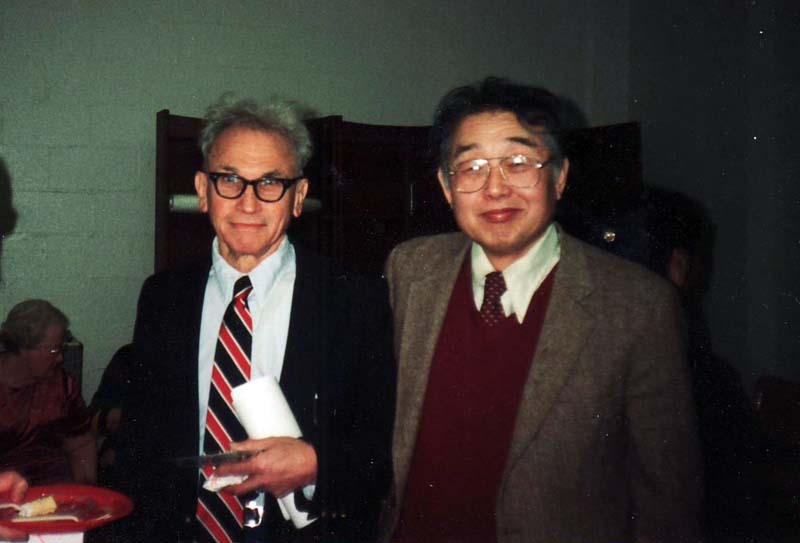 Joe Weber was a hard-working physicist, and I think I worked as hard as he did. 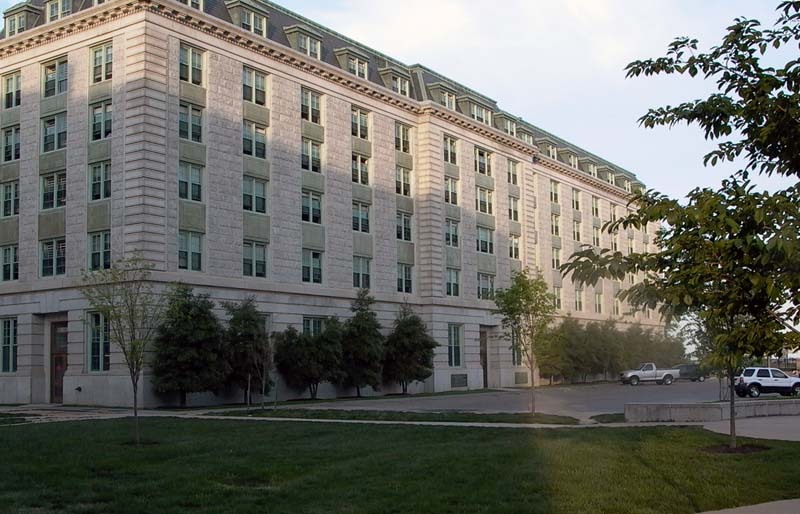 Very often, Weber and I were the only ones in the physics building during the nights and weekends. We praised each other for working hard. In my case, I praised him in order to praise myself. I assume he did the same thing. 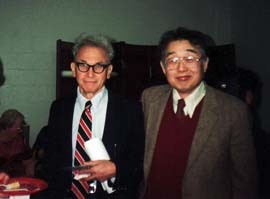 I am very happy to show you my photo with him taken in 1988. He left us in 2000, and I thoroughly miss him. 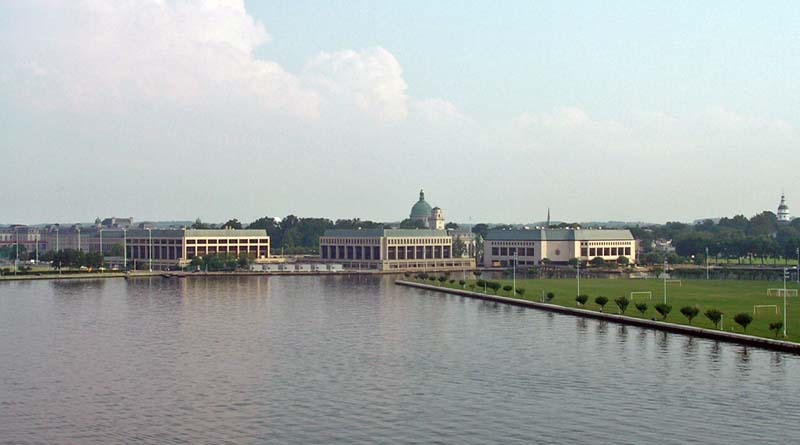 The campus of the Academy is located at the corner of the Annapolis Bay (south) and the Severn River (east). Let us look at some photos. View from the high-rise Naval Academy bridge on the Severn River. 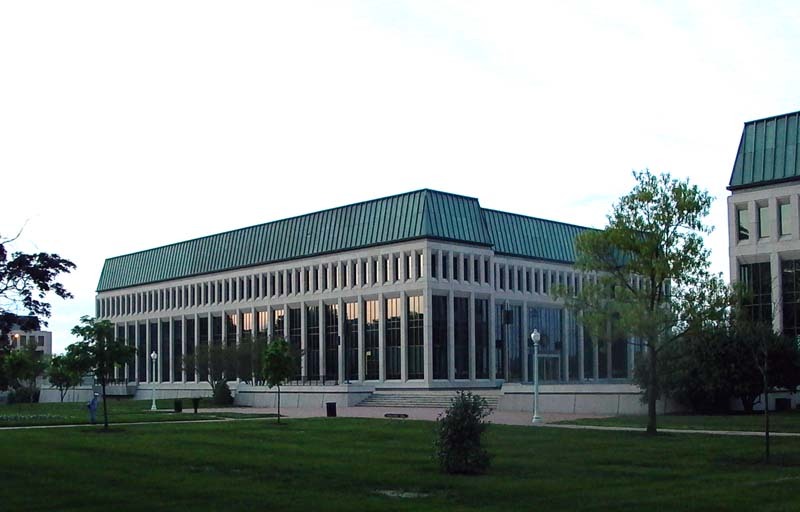 One of those modern buildings is the Michelson Hall, named after Albert Abraham Michelson. Close-up View of the Michelson Hall. 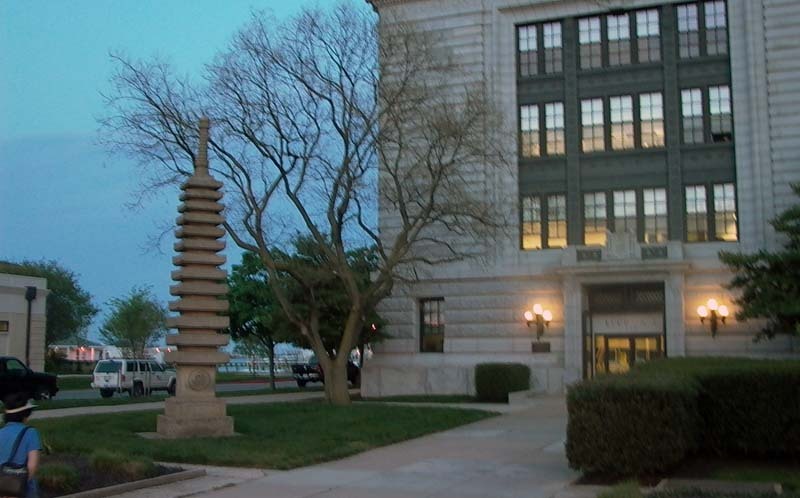 This modern building did not exist when Michelson was a student and an instructor there. Between two Buildings. 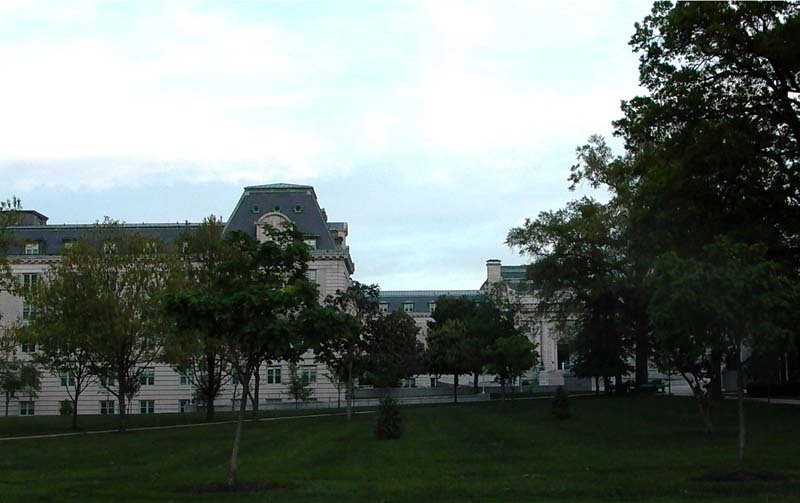 Michelson carried out his experiments at the space between Michelson Hall (left) and Chauvenet Hall (right). A saliboat on the Severn River is seen. 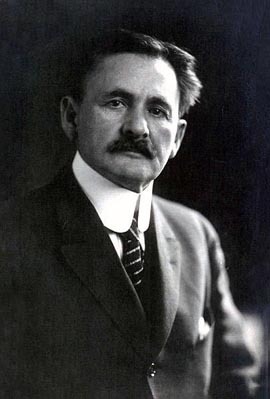 William Chauvenet was a mathematics professor and one of the founding professors of the Naval Academy. 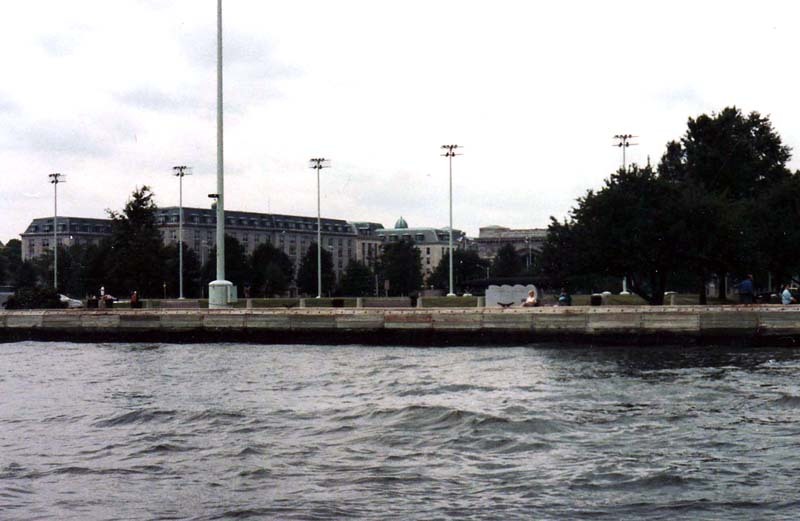 Michelson Site seen from the Severn River (old photo). Copper Plate telling that Michelson measured the speed of light at the place front of the Michelson Hall. Dots tracing the Light Beam from the copper plate. 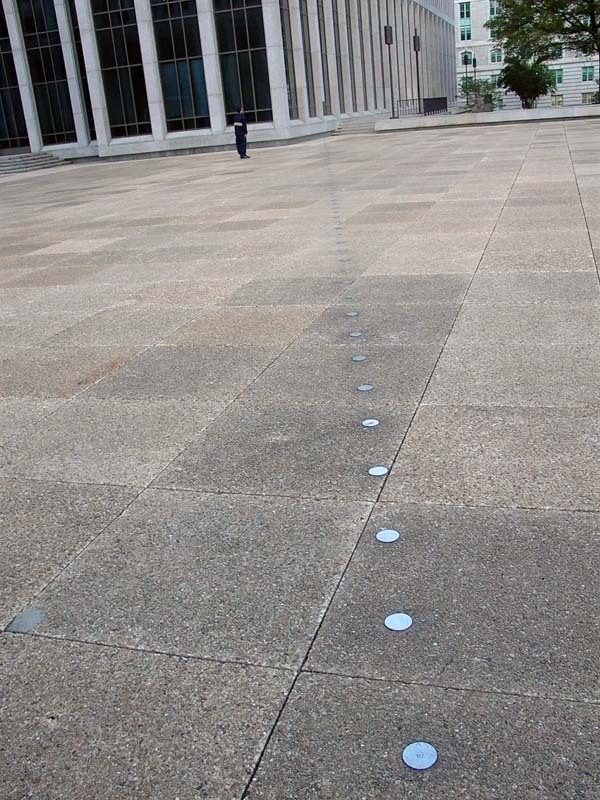 The dots seen from the opposite direction (photo from Wikimedia). 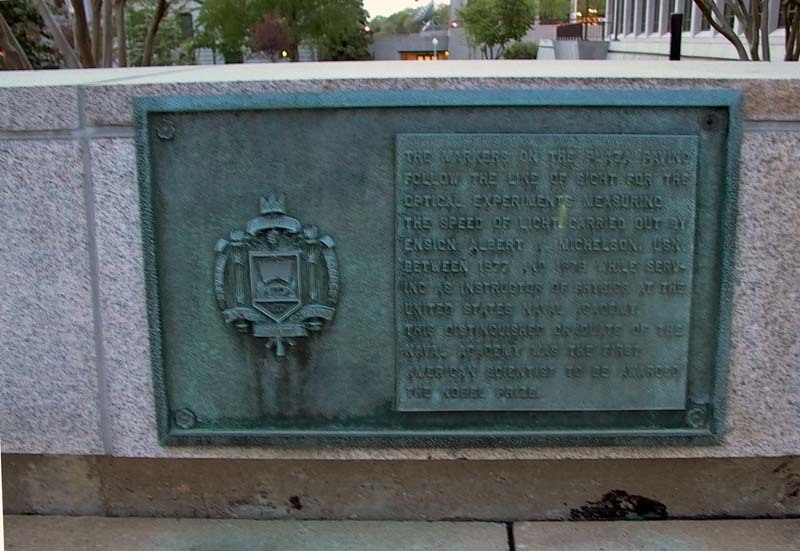 The copper plate is seen. 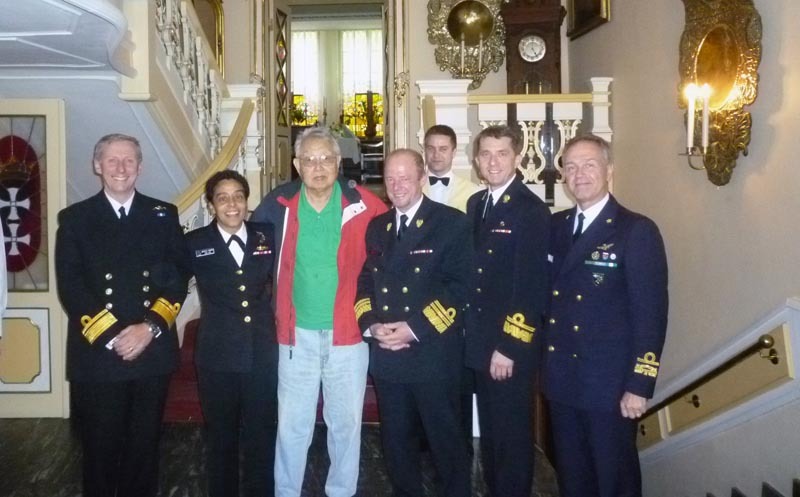 Brilliant Naval Officers I was told that the Naval Academy's main business is to produce able naval officers. 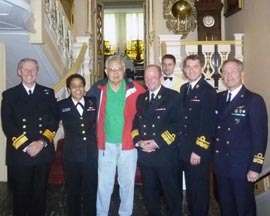 I met one brilliant Annapolis graduate in Gdansk (Poland 2010). This photo was taken at Gdansk's most prestigious sea food restaurant. They are NATO admirals from Britain, Italy, Poland, France, and the United States. 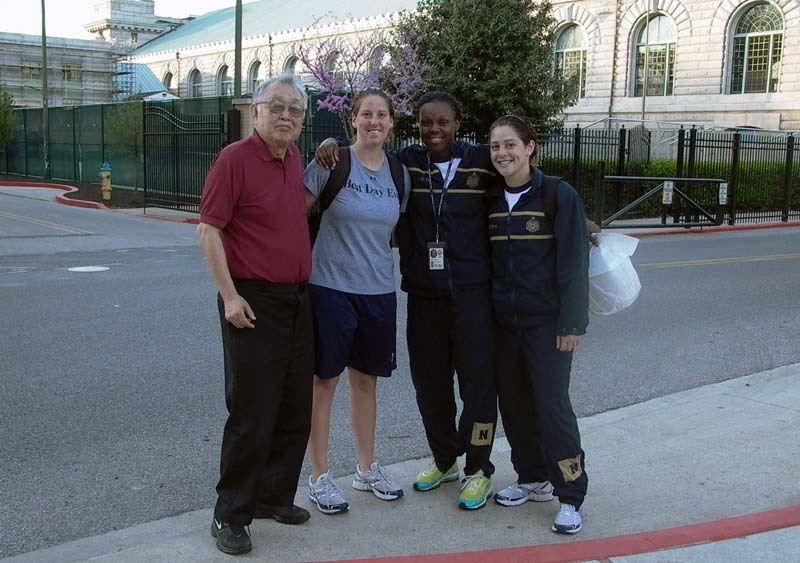 The lady on my right is an Annapolis graduate, and she (from the U.S. Navy) is naturally the boss of this NATO group. She became very happy when I mentioned Michelson. 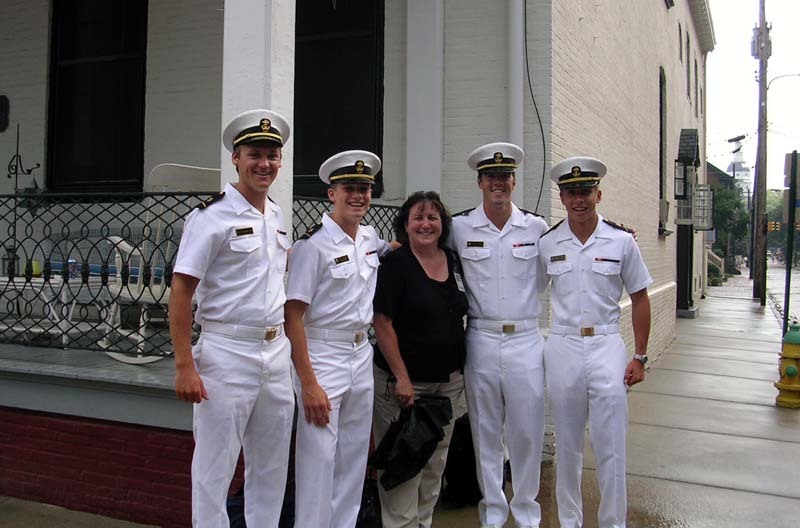 Her name is Michelle Howard, and become the four-star admiral on July of 2014. In 1954, I had a photo with General Maxwell Tyalor who was the commander of the U.S.Forces in Korea. 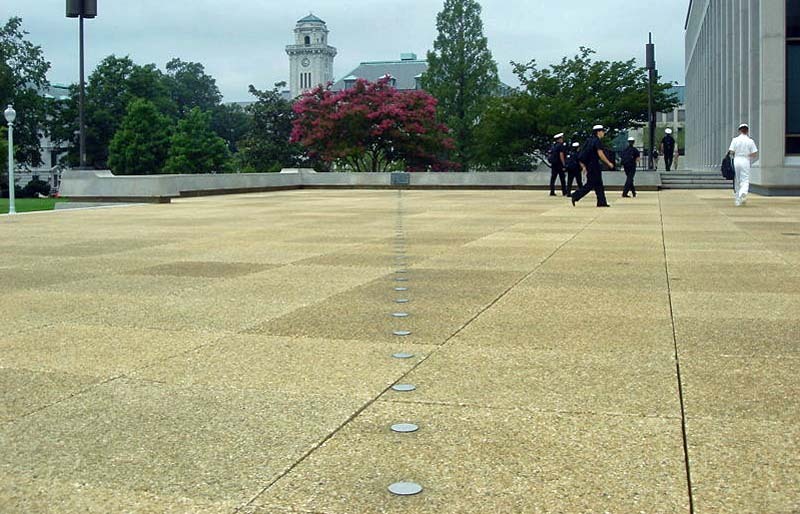 Under him were more than 300,000 combat-ready American soldiers. I was wearing my high-school uniform. 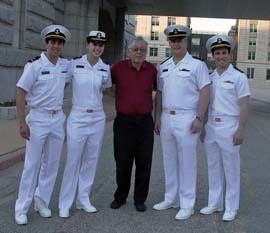 Students in White Uniforms, which they wear when they go out of the campus. 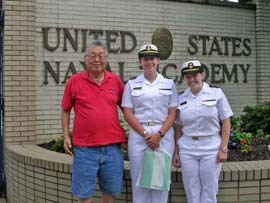 Students in Annapolis outside the campus. Black Uniforms. They wear black uniforms when they go to classes. Male Students in their athletic uniforms. Female Students in their athletic clothes. 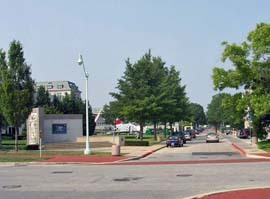 Entrance to the Naval Academy. I am very happy to be with two students. Inside the Entrance. A traditional-style building is seen. Inside the Entrance in a different direction. The Chapel is inter-denominational like all institutional chapels. Multicultural Flavor. 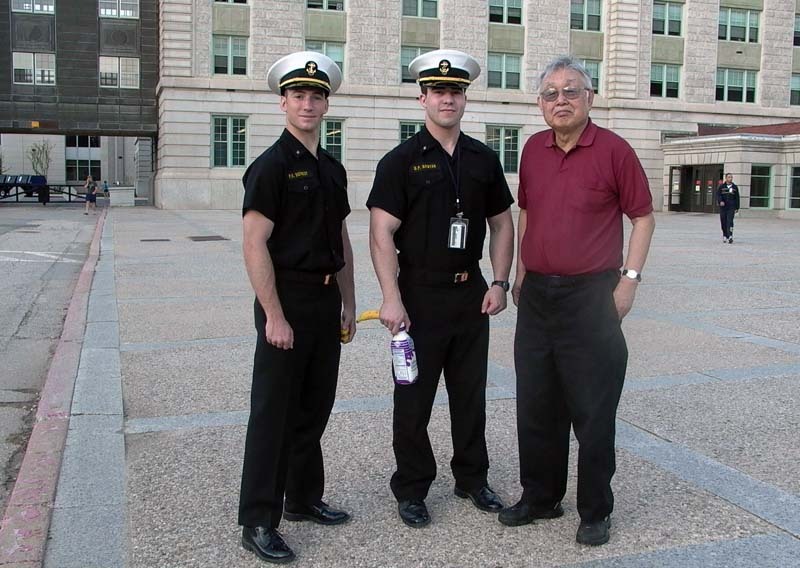 As the United States is becoming a multicultural nation, the campus of the Naval Academy is in pace with this trend. Traditional-style Buildings looking like buildings in Paris. One of the Dormitory Buildings. A huge building indeed! 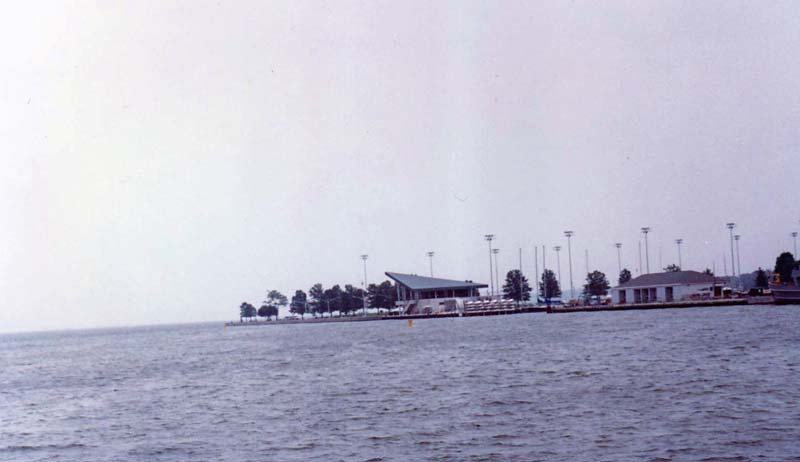 Campus seen from the Annapolis Bay (from an old photo). It is like seeing Paris buildings from the Seine River. Annapolis Bay viewed from the Campus. 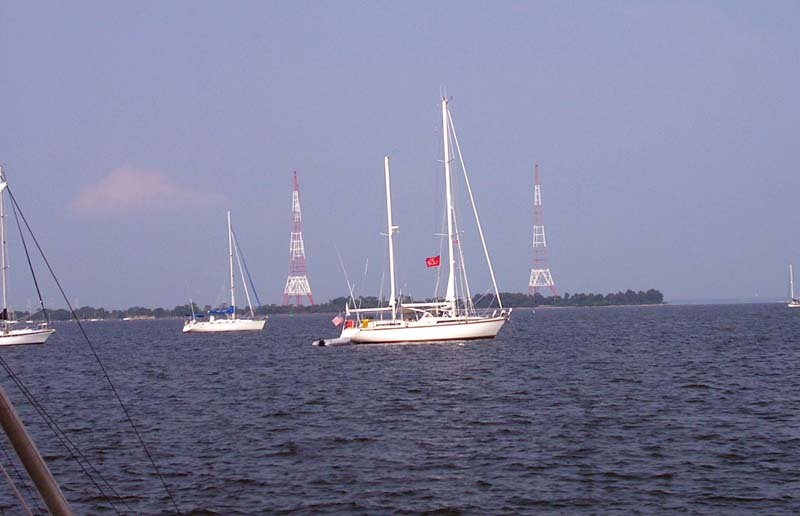 Two navy antenna towers are seen. 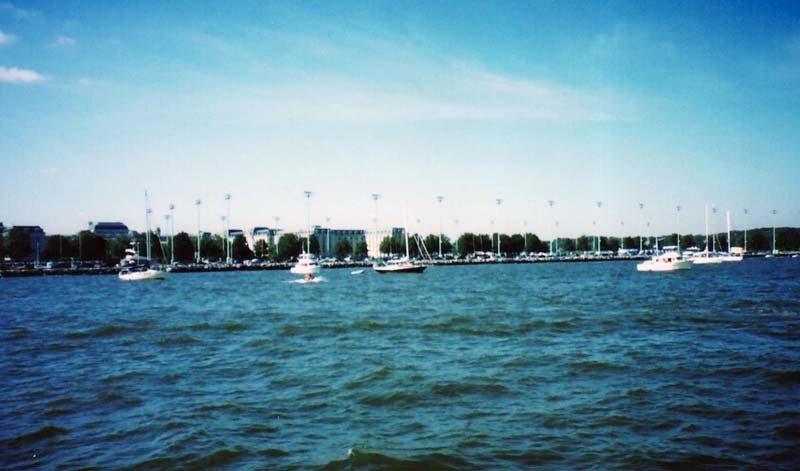 Another view of the Bay with more many boats. Campus Boat House. 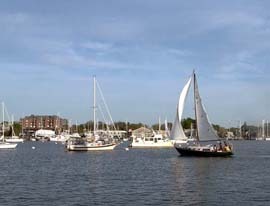 Students are encouraged to spend their time on boats and love the sea. 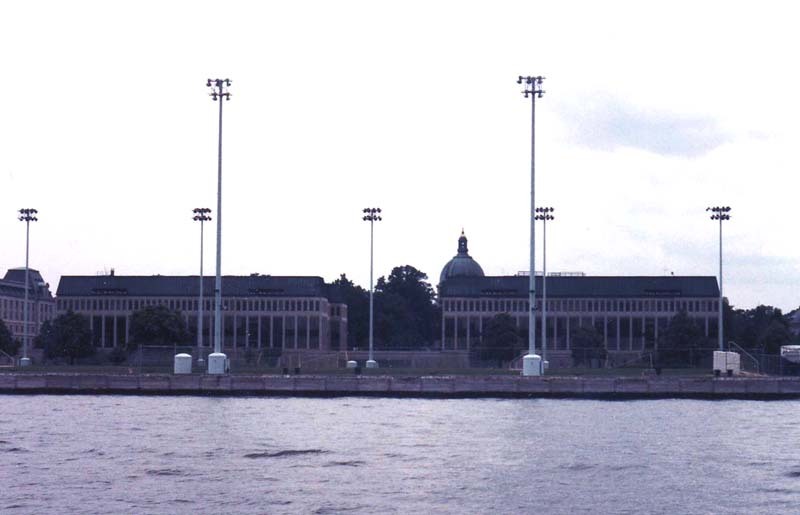 The south-eastern corner of the Campus seen from the Severn River. 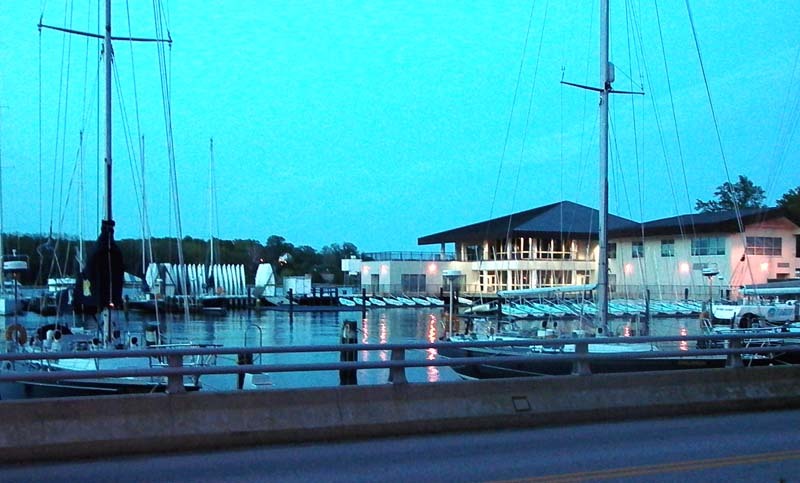 Here is the end point of the River and the water flows to the Annapolis Bay. State House. 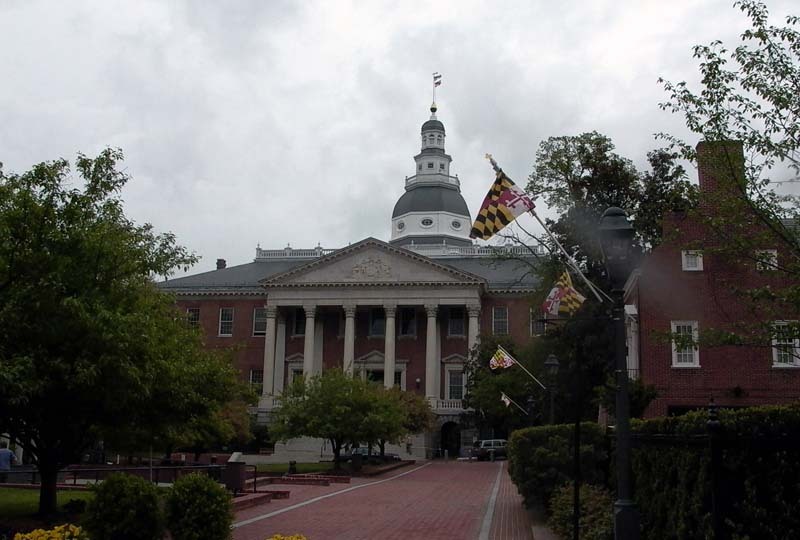 Annapolis is the capital city of the State of Maryland, and there are government buildings. They are laid out like a university campus. 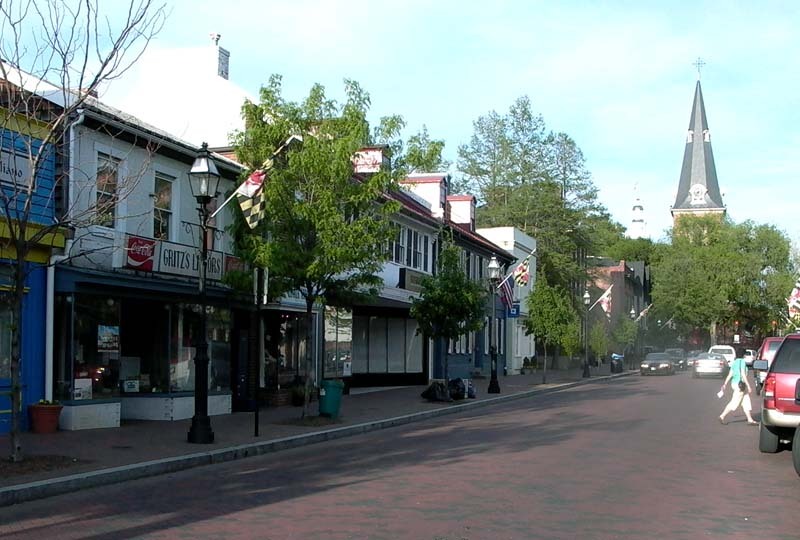 West Street connects the old town with a new town in the western end of Annapolis. St. Anne's Church is seen. 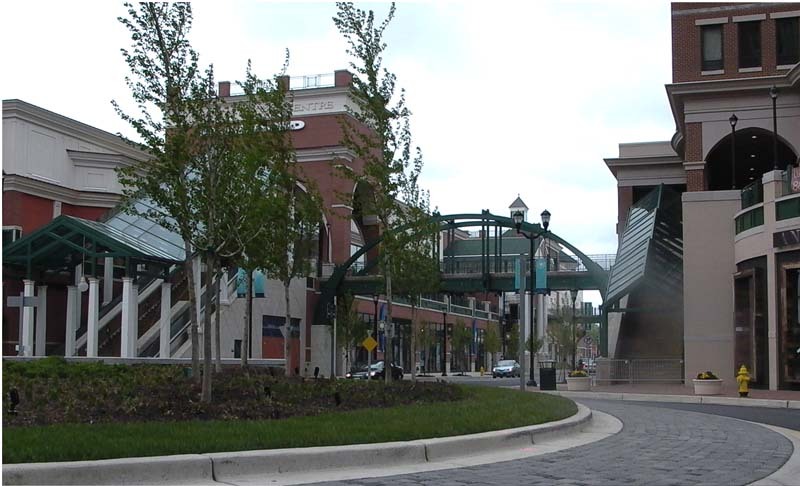 Town Center in the new section of Annapolis. 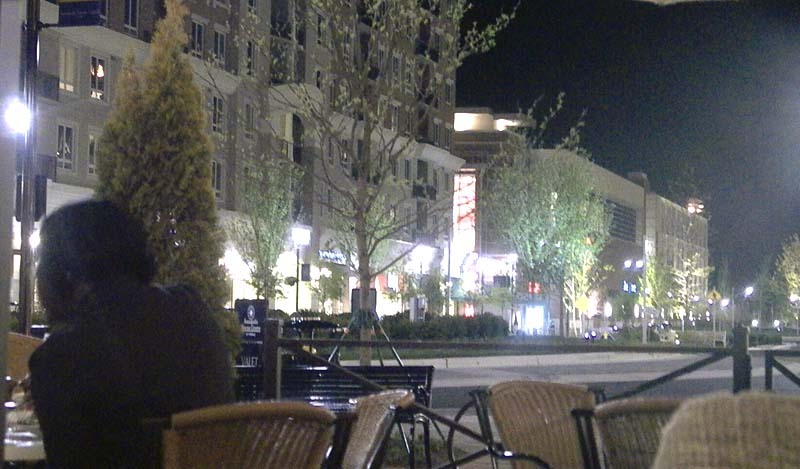 Night Scene of the Town Center. copyright@2010 by Y. S. Kim, unless otherwise specified.